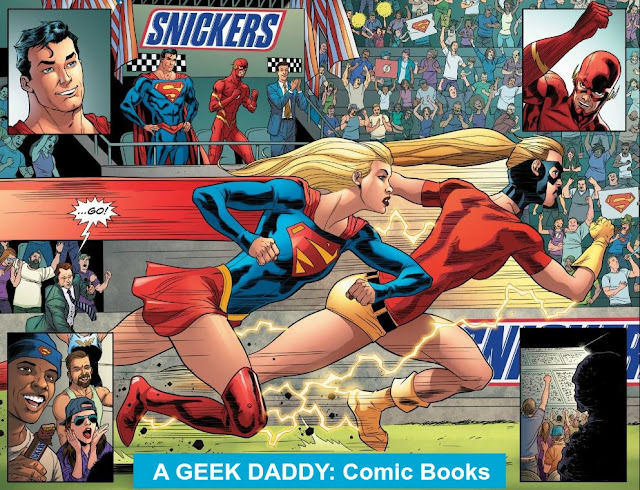 Following up on the success of their Colonel Sanders comic books, DC Entertainment has also created a series of free comic books tied to a promotional partnership with Snickers. In conjunction with the annual Comic Con International event in San Diego this weekend, Snickers Comic #2: The Fastest Woman Alive is now available as a digital download for a limited time on DC Entertainment's online comic book store powered by Comixology as well as at comixology.com. It’s the race of the millennium: Supergirl, the Woman of Steel versus Jesse Quick, super-speedster of the Justice League! But a monstrous figure plans to attack the stadium during the event—and it’ll take both Supergirl and Jesse, plus Superman, the Flash and an army of Snickers-powered spectators, to bring him down! Snickers Comic #2: The Fastest Woman Alive follows up on a free issue provided at last year's Comic Con in San Diego that pitted Super Man versus the Flash in a similar story. Unlike the past KFC Colonel Sanders comics that can still be read online, Snickers Comic #1 is no longer available. So if you are interested in reading this new Snickers comic download it while you can!